What do Jim Mora, the Middle East, Mexico, and all 50 U.S. governors have in common? They’re all in this edition of Random Thoughts from the Humidor. I had to chuckle when I read my colleague’s piece last week about using Liberty cannisters to rid himself of excess humidity. Immediately, my internal monologue took on the voice of former Colts head coach Jim Mora talking about the playoffs. “Excess humidity? Don’t talk about—excess humidity?! You kidding me? Excess humidity? !” George may be warm and cozy down in Florida, but up here in Chicago I can assure you excess humidity is not a concern. Not in the winter months, anyhow. One day last week, the high—the high—in Chicago was -14. Including windchill, it was more like -40. Suffice to say, since cold air can hold less water vapor than warm air, my cigar storage problem is exactly the opposite of George’s right now. I have the anecdotal evidence to back it up. 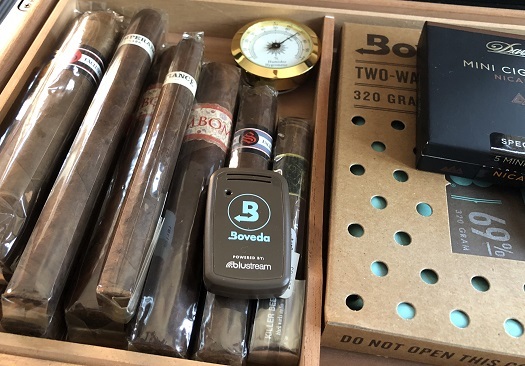 I use Boveda packs to maintain the relative humidity levels within my humidors at home. In the summer, I can go three months or more before needing to replace the packs; in the winter, I’m lucky if they last half as long. Perhaps you have the same experience. Is there any way for George to send his excess humidity up north? Saint Luis Rey Herfing (5.5 x 54, $17) was introduced last week in Cyprus as a Regional Edition for the Middle East. Only 7,500 boxes of 10 have been made. Meanwhile, in Mexico, the Punch Duke becomes the first Regional Edition for the country that’s not an Edmundo Dantes. It has the same dimensions as the Saint Luis Rey Herfing (5.5 x 54), but retails for double the price—$35. Only 6,000 boxes have been made. The three preceding Regional Editions in Mexico were Edmundo Dantes El Conde 109 (2007), Edmundo Dantes Conde 54 (2011), and the Edmundo Dantes Conde Belicoso (2016). If you’re traveling abroad, keep your eyes open for these smokes as they’ll surely be very difficult to find in the U.S.
On Friday, Cigar Rights of America (CRA) sent a letter to each of the country’s 50 governors “alerting them to the state impact of federal regulation of premium handmade cigars.” In CRA’s own words: “Given the potential consequences of these regulations on production and consumption as well as the direct ability to shut down small businesses across the country, CRA felt compelled to alert the governors of the fiscal impact on state OTP tax collections and the potential for job losses and business closures in their states. The letter implores the governors to encourage their state congressional delegation to support legislative efforts to protect the industry.” You can see a complete copy of the letter here. I hope that letter to the governors is just a draft, not the final. Check the penultimate paragraph. Cigar Seeker: Can you expound a bit on your statement. I read the letter and it was mostly okay. Short of calling our elected officials a bunch of dumb asses if they don’t support rollback of the regulations, I’m not sure what else they could say. Maybe reminding the states that an income stream may be reduced or cut off by these regulations might get them on board. After all, it’s all about money. The government does not give a crap about the people, per say. The way they are eager to make weed legal shows they don’t care about people. The affect that grass has on people is immeasurably worse than cigars, yet they are falling all over themselves to approve. I’m reminded of the picture of the scientist in front of a blackboard full of equations and in the middle it says, “then a miracle occurs”. I hope that’s not the best we can expect.